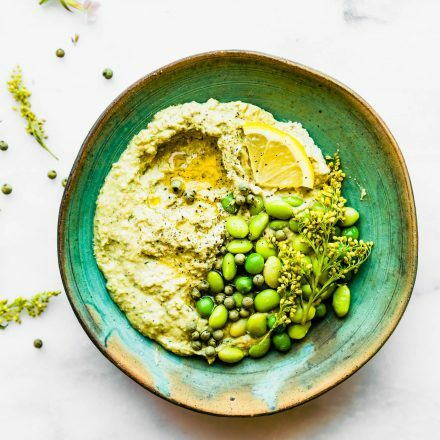 Quick Vegan Edamame Pesto dip! 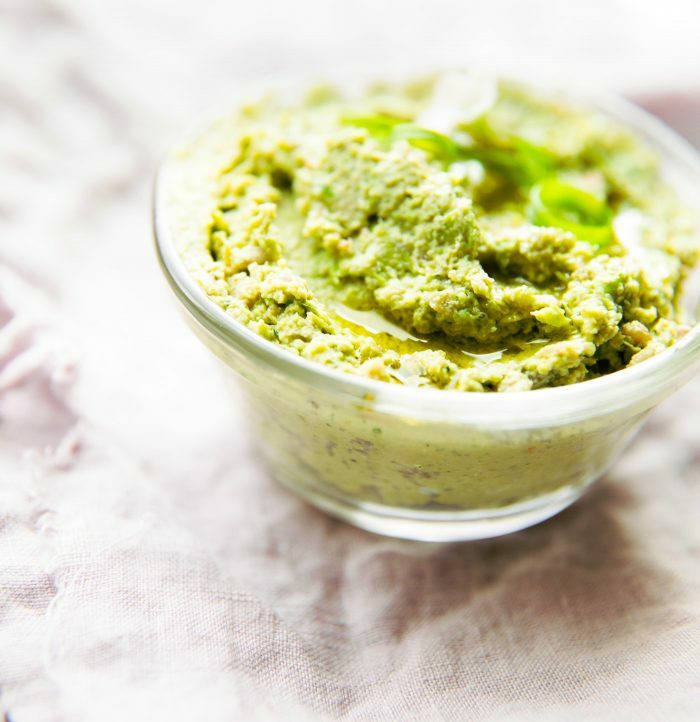 A vegan pesto dip recipe that creamy, healthy, and flavorful. Nut free, rich in plant protein, and made with less than 6 ingredients. Use this edamame pesto dip on a sandwiches, in pasta, or make into wholesome appetizer dip. And then I posted yet ANOTHER pesto recipe. Okay this recipe is more of a pesto dip (that exists, right?) and was originally created way back when I made these California wraps. And guess what? It’s going to be used again in an upcoming plant power lunch recipe. We might as well give it it’s own post, right? So let’s talk about this so called pesto a bit. Because, let’s face it. It’s not a real pesto, but pretty close to it! 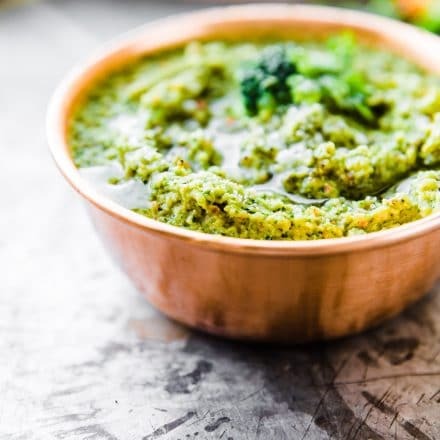 This pesto dip is nut free, protein packed, vegan, and literally made with less than 5 ingredients. It’s super light in texture yet filling and packed with plant based protein. It’s protein packed because ONE –> That little edamame bean can pack so much. For those of you following a paleo diet, you might be wondering if this is healthy. That’s a good question to ponder! Yes! But I would also have to say it depends on if you tolerate soy or if phytoestrogens effect your hormones. If you are, you would definitely know this! But for those of you who are looking for a healthy nut free snack or dip ever so often, then edamame is TOTALLY LEGIT. Does that make sense? I don’t want to label a real plant food as unhealthy just because someone said it’s not paleo. I think all real food can be part of a diet, we just need to figure out what’s best for our nutritional needs at the moment. Make sense? COOL! That being said, I love handful of edamame for snacking from time to time. Not to mention other organic cultured soy foods such tempeh and even sprouted tofu from time to time. It’s filling, rich in iron, calcium, folate, and delicious! 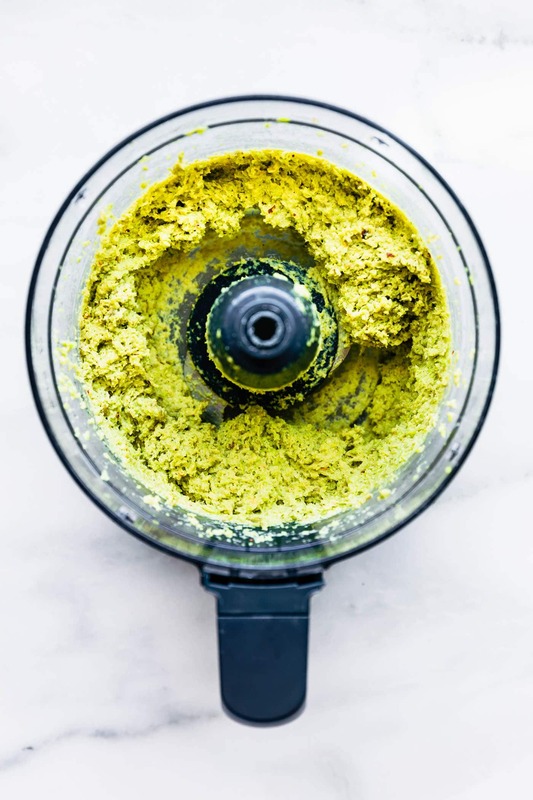 Phew, now that I’ve gotten off my little Soy Step Stool, let’s talk about how to make this edamame pesto dip recipe. Capeesh? Step one. Thaw out edamame beans (shelled). Step two. Place in a blender with sunflower seeds, oil, garlic, and herbs. I like using a little basil or chive. Step 4 Garnish with red pepper flakes, extra edamame pods, olive oil, peppercorns, herbs whatever you’d like! 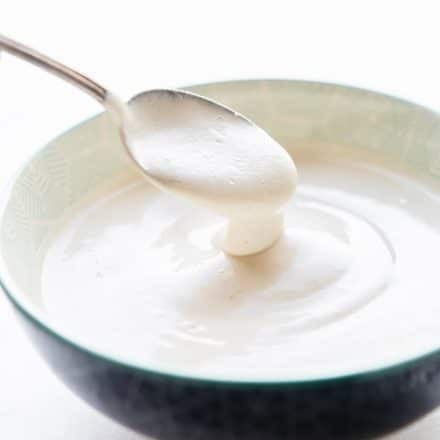 Heck, you could even mix it with a little hummus or yogurt to make it more creamy. Which I did below. Step 5 EAT! Enjoy it as a dip or slather it on all the things. Oops, I mean food things like pasta, sandwiches, wraps, crackers, veggies, etc. Um ya. My job is done! Haha! 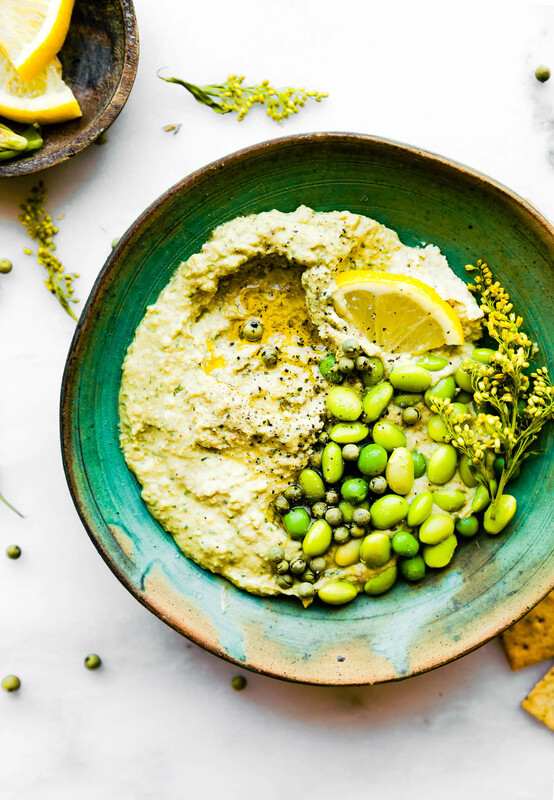 Stay tuned next week for the ultimate farmer’s market sammie using this edamame pesto dip! 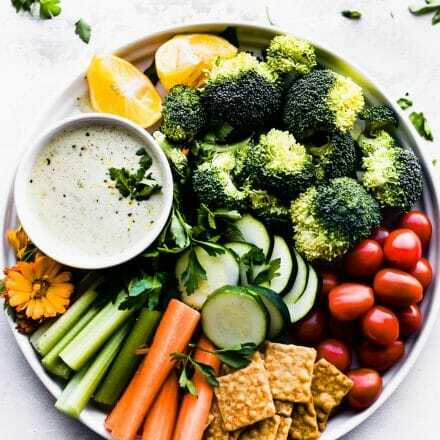 A vegan pesto dip recipe that creamy, healthy, and flavorful. Nut free, rich in plant protein, and made with less than 6 ingredients. Delicious on sandwiches, in pasta, or make into wholesome appetizer dip. 1/4 tsp of sea salt and pepper each. For extra spice mix in 1/4 tsp red pepper flakes as well. Place fresh or frozen edamame (soy beans without shell) into a large microwave-safe bowl with 1/4 cup water or broth. Microwave for 2-3 minutes until edamame is soft (steamed) and warm. You can also do this on the stove. all the way through. 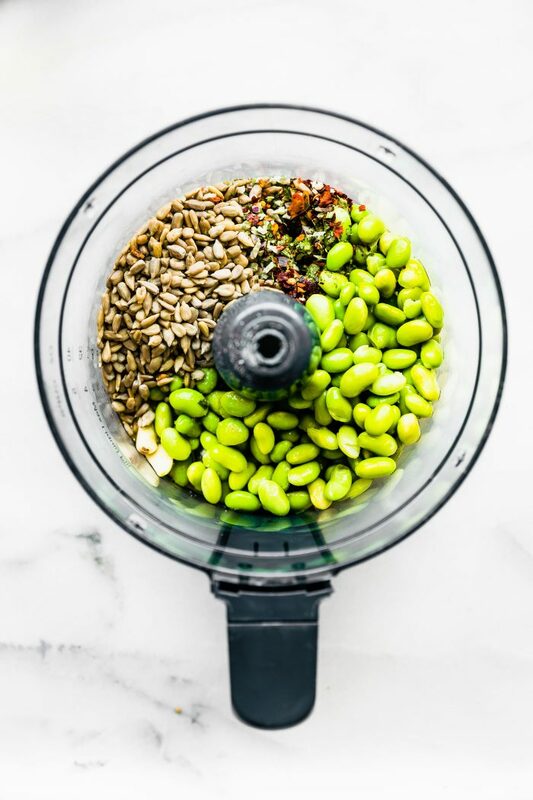 Combine your edamame, sunflower seeds, garlic, in a food processor. Blend until combined. Next add in your olive oil, lemon, optional herbs, and salt/pepper. Blend again until thick pesto is formed. If you wish to make a thinner creamier dip, see notes. For Extra Creamy version blend in 1/4 c hummus, avocado, or yogurt (non dairy). On and one last thing! A very important thing! Aren’t you digging this turquoise rustic pottery? Well good! 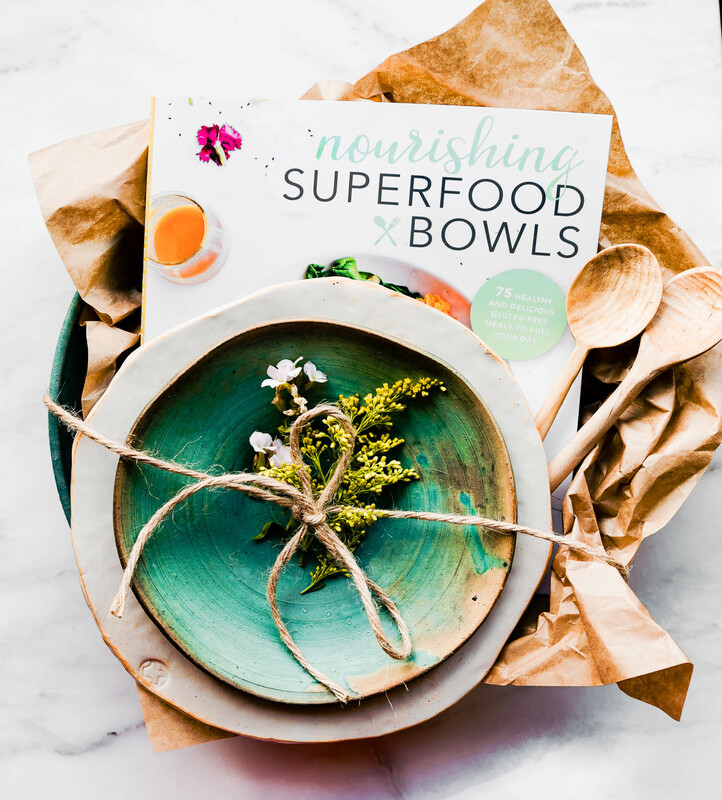 Because it’s up for grabs in an EPIC 5 day INSTAGRAM GIVEAWAY along with my cookbook! All thanks to Texas Farmhouse Pottery. Which you must check out! Love love love her story. 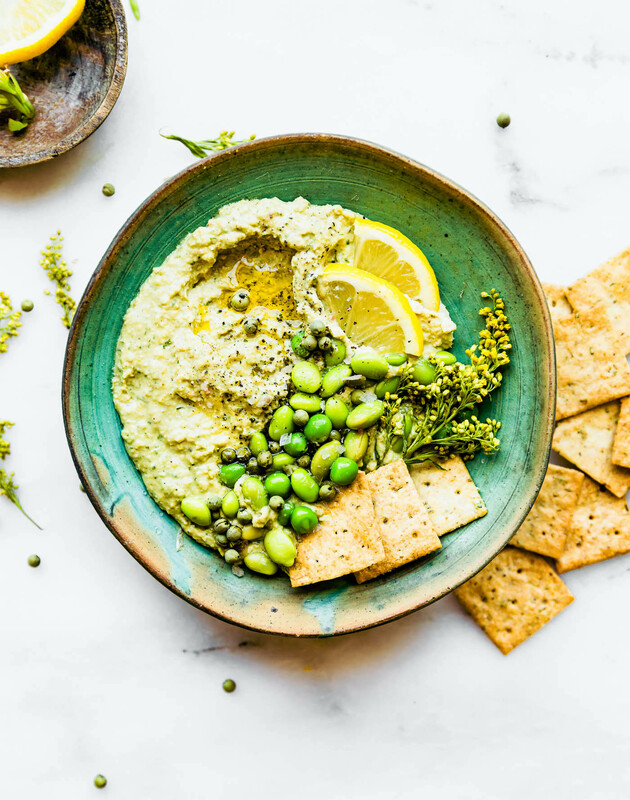 Spill the EDAMAME BEANS… Favorite pesto-ish dip? Our garden is overflowing with Basil! I will have to give this a try and use that as the herb!! Oooh, I want to dive head first into this dip! I did not know all this goodness about edamame, but I do know I love all kinds of pesto. Adding this to my must try list. I love this. Sometimes I think soy gets overly demonized; I know there are those who definitely can’t eat it, and I totally understand that. But if you can eat it especially in those forms of tofu and edamama, I’m on board with that. 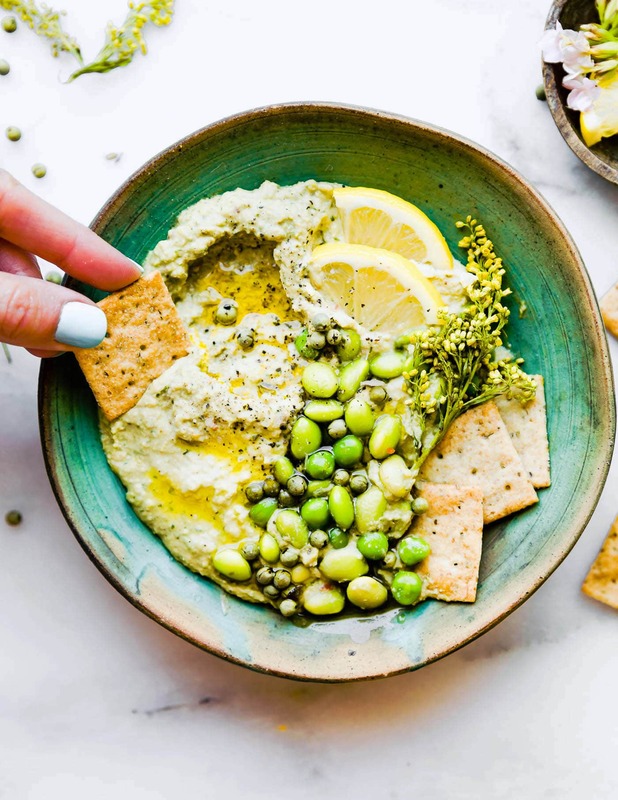 If a serving is only two tablespoons, then I will need SOMEONE ELSE to serve this to me because I could easily put down the entire batch of edamame dip! LOL! Edamame beans are one of my favorites and I rarely ever eat them because we only have them in sushi places! But regardless, they’re delicious. I definitely agree that soy is far too demonized in the health community. It has so many health benefits, though everyone should take physiological reactions into consideration…ALWAYS. Haha totally allowed! 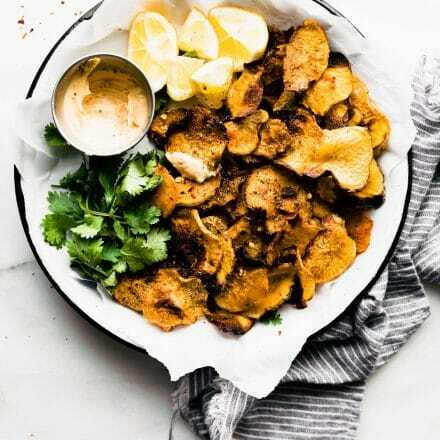 This recipe is so up your alley Cassie! Love that you share the same SOY opinion too. The Web gives us an opportunity to discover tons of new recipes. Especially if you want to be healthy. Natural food is my addiction. It retrieves much more energy than anything else (besides physical activity). I am always trying to collect every new cool recipe in order to check it afterward. Stay healthy and thanks for sharing!